This National Convention of Workers being held under the banner of joint platform of all the Central Trade Unions of the country along with independent national federations of all sectors and service establishments expresses deep concern over anti worker, anti-people and pro-corporate actions of the present Govt. at the Centre in pursuance of the policy of the globalisation. During this period the Govt. has been over-busy in amending all labour laws to empower the employers with unfettered justifys to “hire and fire” and stripping the workers and trade unions of all their justifys and benefits besides aggressively pushing through almost unlimited FDI in strategic sectors like Railways, Defence and Financial Sector. Also, through sweeping changes in the existing Land Acquisition Act, farmers’ justify to land and agri-workers’ justify to livelihood are been sought to be drastically curbed and curtailed. The Govts’ aim in aggressively pushing through sweeping changes in labour-laws is nothing but to push our overwhelming majority of workers out of the coverage of all labour laws and to drastically curb the trade union justifys. The CTUs had besides other issues raised the issue of strict enforcement of labour laws and universal social security but this Govt. is doing away with all justifys-components in all the labour laws aiming at creating conditions of bonded labour in all the workplaces. EPF and ESI schemes are proposed to be made optional which is also aimed at demolishing the PF and ESI schemes dismantling the basic social security structures available to the organized sector. And for the vast unorganized sector workers, old schemes are being repackaged and renamed, without providing for funds and implementation-machinery/network with a view to befool the people. The Govt. has not taken any step to curb price rise of essential commodities and to generate employment except making tall claims of containing inflation in the media. On universalising public distribution system, the Govt. is trying to scuttle it through Direct Benefit Transfer resulting further squeeze on the common people. During the year with the support of the present Govt. various state governments have brought about drastic anti-workers changes in basic labour laws viz., Industrial Disputes Act, Contract Labour (Regulation & Abolition) Act, Factories Act and Apprenticeship Act, Trade Unions Act etc introducing “hire & fire”, throwing more than 71% of factories out of coverage of Factories Act and making all contractors employing up to 50 workers free from any obligation towards workers. The Central Govt. on its part has introduced amendments to Factories Act raising doubly the limit of workers for registration of factories, put in public domain the proposals for new Small Factories (Regulations of Service conditions) Bill which prescribes that major 14 labour laws will not apply to factories employing upto 40 workers. Labour Code on Wages Bill and Labour Code on Industrial Relations Bill which under the cover of amalgamation seek to make registration of unions almost impossible, making retrenchment and closure almost free for the employers class. These bills have been put in public domain without consulting the trade unions thereby violating the provisions of ILO Convention 144 on Tripartite Consultation. Amendments have also been brought in EPF & MP Act and ESI Act to make it optional with a sinister design to finally demolish the two time-tested statutory schemes for the workers. The Prime Minister’s office has written to the Chief Secretaries of States to follow Rajasthan Model in labour laws. All these amendments are meant to exclude 90% of the workforce from application of labour laws thereby allowing the employers to further squeeze and exploit the workers. The Convention also expresses dismay over the Govt’s total inaction in implementing the consensus recommendations of 43rd , 44th and 45th Indian Labour Conference of formulation of minimum wages, same wage and benefits as regular workers for the contract workers and granting status of workers with attendant benefit to those employed in various central govt schemes like anganwadi, mid-day-meal, ASHA, para-teachers etc. On the contrary, the Govt drastically curtailed budget allocations to all those centrally sponsored schemes meant poor peoples’ welfare. It is also noted with utter dismay that the present government is also continuing to ignore the twelve point demands of entire trade union movement pertaining to concrete action to be taken for containing price-rise and aggravating unemployment situation, for strict implementation of labour laws, halting mass scale unlawful contractorisation, ensuring minimum wages for all of not less than Rs 15000 per month with indexation and universal social security benefits and pension for all including the unorganized sector workers, etc. The demands also include compulsory registration of Trade Unions within 45 days and ratification of ILO Conventions 87 and 98. Even the legislations passed by Parliament on the issue of Street Vendors is not being implement appropriately. The National Convention also denounced the retrograde move of the Govt. in hiking/allowing FDI in Defence, Insurance, Railways and other sectors and also its aggressive move for disinvestment in PSUs including Oil and financial sector aiming at total privatisation which will be detrimental to the interests of the national economy, national security as well as mass of the common people. The National Convention also condemned the sweeping change sought to be brought in Land Acquisition Act permitting forcible acquisition of land from the farmers and putting in jeopardy the livelihood of agricultural workers. It is disgusting to note that 147 workers of Maruti-Suzuki at Manesar are being forced to languish in Jail for more than two years on false and fabricated charges. It is unfortunate that even after the assurance of Prime Minister to revive the closed NOKIA Sriperumbudur unit, the recent decision to sell it out demonstrates Government approach to deny protection to workers. The coal sector has already been opened for commercial operations by private sector. The Convention supports the decision of the constituents of JCM of Central Govt. employees to go for indefinite strike from 23rd November, 2015 and will decide at appropriate stage the form of solidarity action to be taken. The Convention also congratulates coal, postal, transport and telecom workers for their strike against policies of the Govt. The Convention demands upon the Central Govt. to stop forthwith the process of making retrograde amendments to the labour laws. The Convention also demands immediate steps to implement the consensus recommendations of successive Indian Labour Conferences and also positive response to long pending demands of the entire trade union movement of the country. The Convention urges the Central Govt. to desist from mindless drive for disinvestment in CPSUs and liberalising FDI in defence, insurance, Railways etc. and the convention also condemns the Govt. move of corporatization of major ports and postal services etc. The Convention urges the Govt. to reverse the direction of the ongoing economic policy regime which has landed the entire national economy in distress and decline affecting the working people most. 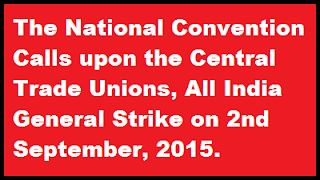 The National Convention calls upon the trade unions and working people irrespective of affiliations to unite and make the countrywide General Strike a massive success. and All India Federations of Banks, Insurance, Defence, Railways, Central/State Govt. The veterans community of defence services has been sorely disappointed by the absence of any announcement regarding implementation of One Rank One Pension (OROP) by the union government after the completion of an year in office and discussions have begun on whether this is the right time to hold a nation-wide agitation to press for the same. Throughout the day yesterday, there was a buzz of excitement on social media groups as the veterans got the impression that Prime Minister Narendra Modi would make an announcement regarding OROP at his rally in Bareilly. However, no such announcement was made causing consternation among the veterans ranks. Brig Gurmeet Kanwal (retd), a well known strategic expert tweeted, “All Veterans and those who support them are requested to retweet please… #OROP Prime Minister we are disappointed”. Air Marshal Anil Chopra (retd), member of Armed Forces Tribunal tweeted, “ OROP overtakes DDLJ as the longest running reality show”. Speaking to The Indian Express, Brig KS Kahlon (retd), President, All Indian Defence Brotherhood, said that non implementation of OROP has caused great amount of resentment among the veterans and they are gearing themselves up for a prolonged agitation to ensure that the government delivers on its promise. Prime Minister Modi made repeated assurances at many places, and while addressing the troops at the highest battlefield of the world, Siachin, on the eve of Diwali last year, he stated that the order of implementation of OROP had been issued. Defence Minister Manohar Parrikar repeatedly assured the veterans that the NDA government will implement OROP before the government completes a year in office. Unfortunately the government hasn’t lived up to its promise,” said Brig Kahlon. The veterans had conducted a mass movement during the tenure of the UPA government wherein they had returned their medals to the President and held rallies at Jantar Mantar to force the government to accept their demand of OPRP. According to Lt Col SS Sohi (retd), President of Ex-Servicemen Grievances Cell, the time has come when another such mass agitation may have to be held all over the country again. We are still willing to wait for a few days more for an announcement in this regard. If by the end of this month if they do not do anything we will go for an agitational approach. There have been several meetings with the defence minister and several promises made but each time the veterans community has been let down. We must take recourse to a more tough approach if we have to force the government to concede to our legitimate demands,” said Lt Col Sohi. However, Lt Gen Raj Kadyan (retd), a former Deputy Chief of Army Staff and Chairman of Indian Ex-Serviceman Movement was of the view that the hype over the expected announcement by PM was largely “self created”. “We were hoping that the PM would make the announcement but I am of the view that there is no need as yet to hold an agitation. We have waited for 33 years and we should wait for some more time,” he said. Subject: Pay fixation of direct recruit Assistants appointed after 1.1.2006 – Stepping up of pay of DRs with reference to the pay of junior promotee Assistants – Clarification regarding. The undersigned is directed to draw attention to the issue of stepping up of pay of direct recruit Assistants, appointed on or after 1.1.2006 at par with the pay of the UDCs promoted and appointed to the post of Assistant between 1.1.2006 to 31.8.2008 Whose pay has been fixed in terms of para 2(c) of Department of Expenditure’s U.O. No.10/1/2009-IC dated 14.12.2009. 3. All the Ministries /Departments are therefore advised to review all the cases wherein stepping up of pay has been allowed to direct recruit Assistants appointed on or after 1.1.2006 with reference to the pay of their junior promotee Assistants. 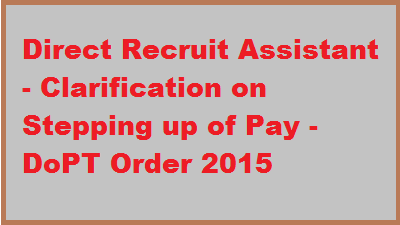 The pay fixation in revised pay structure of such direct recruit Assistants be revised immediately and action be initiated for effecting recoveries of excess payments, if any, as per extant instructions. Grant of Dearness Relief to CPF beneficiaries in receipt of ex-gratia payment w.e.f 01.01.2015. Subject: Grant of Dearness Relief to CPF beneficiaries in receipt of ex-gratia payment w.e.f 01.01.2015. (i) The surviving CPF beneficiaries who have retired from service between the period 18.11.1960 to 31.12.1985 and are in receipt of ex-gratia @ Rs.600/ p.m. w.e.f. 1.11.1997 under this Department’s OM No. 45/52/97-P&PW(E) dated 16.12.1997 & revised to Rs.3000, Rs.1000,Rs.750 &Rs.650 for Group A, B, C & D respectively w.e.f 4th June,2013 vide OM No. 1/10/2012-P&PW(E) dtd. 27th June, 2013 are entitled to Dearness Relief @ 223% w.e.f. 1.1.2015. (ii) The following categories of CPF beneficiaries who are in receipt of ex-gratia payment in terms of this Department’s OM No. 45/52/97-P&PW(E) dated 16.12.1997 are entitled to DR @ 215% w.e.f. 1.1.2015. (a) The widows and dependent children of the deceased CPF beneficiary who had retired from service prior to 1.1.1986 or who had died while in service prior to 1.1.1986 and are in receipt of Ex-gratia payment of Rs. 605/- p.m. & revised to Rs 645 w.e.f 04 June ,2013 vide OM No. 1/10/2012-P&PW(E) dated 27th June,2013. (b) Central Government employees who had retired on CPF benefits before 18.11.1960 and are in receipt of Ex-gratia payment of Rs. 654/-, Rs. 659/-, Rs. 703/- and Rs. 965/-. 2. Payment of DR involving a fraction of a rupee shall be rounded off to the next higher rupee. In their application to the Indian Audit and Accounts Department, these orders issue in consultation with the C&AG. 3. This issues with the concurrence of Ministry of Finance, Department of Expenditure vide their OM No 1(4)/EV/2004 dated 25.05.2015. Indian Banks Association inked wage settlement with Employee Unions and Officers’ Associations today, 25th May, 2015. The settlement gives 15% increase in salary and Allowances to about 10 lakh bank employees. Employees and officers from 43 banks including public sector banks, old private sector banks and some of the foreign banks benefit from the wage revision. The current wage revision is effective from 1st November 2012 and will be valid for 5 years. In all 11 All India Employees Unions and Officers’ Associations participated in the wage revision exercise. Another important feature of the settlement is that a medical insurance scheme is being introduced for families of employees. The 15% wage revision would cost the Public Sector banks Rs.4725 crores as incremental Salary and allowances in a year. Banks have been making provision for wage revision from November 2012. Mr. T M Bhasin, Chairman, IBA and Mr. Rajiv Rishi, Chairman, Negotiating Committee of IBA led the Management team in the negotiations. IBA expects banks will implement the revision immediately. IBA expects the salary revision to improve the moral of the bank employees, leading to better productivity. SUB: GRANT OF FIXED MEDICAL ALLOWANCE (FMA) TO THE ARMED FORCES PENSIONERS/FAMILY PENSIONERS IN SUCH CASES WHERE DATE OF RETIREMENT IS PRIOR TO 1.4.2003 AND WHO HAD OPTED NOT TO AVAIL MEDICAL FACILITIES AT OPD OF ARMED FORCES· HOSPITALS/MI ROOMS AND ARE NOT MEMBERS OF ECHS. The undersigned is directed to refer to the Govt. of India, Ministry of Defence letter No. 1(1)/98/D(Pen/Sers) dated 15th June 1998 and letter of even number dated 12th January 2011 regarding grant of Fixed Medical Allowance (FMA) of Rs.300/- p.m. with effect from 1.9.2008 to Armed Forces Personnel/Family Pensioners for meeting expenditure on day to day medical expenses that do not require hospitalization unless the individual had opted for OPD treatment in armed Forces Hospitals/ M.I. Rooms and convey the sanction of the President for enhancement of the amount of FMA from Rs. 300/- to Rs. 500/-. The other conditions for grant of FMA shall continue to be in force. 2. Ex-Servicemen who retired on or after 01 Apr 2003 have to become member of ECHS compulsorily and are not eligible to draw Fixed Medical Allowance. These orders applicable only in such cases, where the date of retirement is prior to 1.4.2003 and who had opted not to avail medical facilities at OPD of Armed Forces Hospitals/ MI rooms and are not members of ECHS. 3. These orders will take effect from 19.11.2014. 4. All other conditions as laid down in Government of India letter No.1(1)/98/D(Pen/Sers) dated 15th June 1998 will continue to apply. 5. This issues with the concurrence of the Ministry of Defence (Finance/ Pension) videtheir I.D. No. 32(9)/2010/Fin/Pen dated 30.03.2015. Please refer to your online grievance No.PMOPG/2015/83480 dated 28th April, 2015 regarding proposed call for Strike on 23.11.2015. Subject: Special Recruitment Drive to fill up the vacancies for Persons with Disabilities. The Hon‘ble Supreme Court in its interim Order dated 28.04.2015 in Contempt Petition No. 499/2014 in Civil Appeal No. 9096/2013 in the matter of National Federation of Blind has, inter-alia, directed that the period for filling up of vacancies of Persons with Disabilities needs to be suitably compressed. Keeping in view the direction of the Hon’ble Supreme Court, the competent authority has approved launching of Special Recruitment Drive for filling up of unfilled vacancies of Persons with Disabilities. 2. In a meeting held on 08.05.2015 under the Chairmanship of Secretary (Personnel) with more than 45 Departments/Ministries, the issue of launch of the Special Recruitment Drive was discussed in detail. Simplification of Pension process for permanently disabled children/siblings and dependent parents. 2. Before allowing the family pension for life to any such son or daughter, the appointing authority shall satisfy that the handicap is of such a nature so as to prevent him or her from earning his or her livelihood and the same shall be evidenced by a certificate obtained from a Medical Board comprising of a Medical Superintendent or a Principal or a Director or Head of the Institution or his nominee as Chairman and two other members, out of which at least one shall be a Specialist in the particular area of mental or physical disability including mental retardation setting out, as far as possible, the exact mental or physical condition of the child. As per GOI, MOD Letter No.- PN/7995/D(Pen/Pol)/2010 dated 01.10.2010, the family Pension to the dependent disabled siblings shall be payable if the siblings were wholly dependent upon the Armed Force Personnel immediately before his or her death and deceased Armed Force Personnel is not survived by a widow or an eligible child or eligible parents. 3(a). In terms of GOI, MOD Letter No. B/38207/ AG/PS4/931/B/D(Pen/Ser) dated 6.08:-1998 the-family pension-to the parents-shall-be-payable if-the parents were wholly dependent on the Armed force Personnel immediately before his or her death and the deceased Armed force Personnel is not survived by a widow or an eligible child. 7. The authorization as indicated above shall be made in the PPO or by issuing a revised PPO if a child, parents or siblings is authorized for family pension after issue of the PPO. The revised PPO shall take the usual route to the Pension Disbursing Authority. The Pension Disbursing Authority shall start disbursing family pension to the permanently disabled child/sibling or dependent parents after the death of the pensioner/spouse/other family pensioner, as the case may be, on the basis of the PPO /revised PPO, approval of the appointing authority and the death certificates/s) of the pensioner and other family pensioners and the self-certificate for income. 8. Such an authorization shall become invalid in case a person becomes member of family after issue/amendment of such PPO and is entitled to family pension prior to the disabled child/sibling/dependent parents at the time of the death of the Pensioners/spouse. For example, the pensioner may marry/remarry after the death of first spouse or adopt a child. Such spouse/child may be eligible for family pension at the time of death of the pensioner or death/ineligibility of the spouse. A child adopted by the spouse of the pensioner shall not be treated as a member of the Family of the deceased pensioner. A decision regarding grant of family pension in such cases will be taken by the appointing authority in accordance with provisions of A 151/80. 10. This issues with the concurrence of the finance Division of this Ministry vide their UO No. 10(01)/2015/FIN/PEN dated 24.03.2015. Not many would have know this message that there are a number of retired Central Government employees who had completed 40 years of their service without utilizing even a single LTC facility. In the past, not many were interested in LTC because the families were big and only the lowest class journey fare was reimbursed by the Central Government. But, now, LTC includes travel in air-conditioned class and air-fare. Not surprisingly, employees are now very much interested and are utilizing the facility without fail. Practical difficulties began when a number of employees began to travel. One of them was the situation where the office location and the employee’s hometown are the same. Usually, Central Government employees are posted in towns and cities that are away from their hometown, or their native place. At the time of joining, the employees are required to denote a village or town as their home Town. This cannot be changed. Once in every four years, the Government would give the option to reimburse the to and fro travel tickets for the employee and his/her family to go to their hometown to meet their relatives and to look after the family’s immovable properties located there. This facility is called the Home Town LTC. In the past, since only a few utilized this facility, there wasn’t any confusion in implementing them. When the Government announced that Home Town LTC could be converted as All India LTC, troubles began and clarifications were required. LTC rules state that the headquarter/place of posting and the employee’s Home Town are the same, then he/she is not entitled to the conversion of Home Town LTC. There are many questions in the minds of the employees about this clause. Will the facility of Home Town LTC be denied if the headquarters and home town share the same Postal Pin code? Does this apply if both come under the limits of the same municipality or Panchayat? Will the 8 KM rule of CGHS apply to this? Should the home town and headquarters not be located in the same district? What does the phrase “irrespective of distance,” which is underlined in a number of orders, mean? Will the interpretation differ from one office to the other? A number of such doubts prevail among employees. One thing is for certain – Central Government employees will now be very alert about definitions regarding hometowns. I am directed to say that the consolidated orders on the subject of Night Duty Allowance were issued by the Department of Personnel and Training vide their OM No.12012/4/86-Estt(Allowances) dated 4th Oct. 1989. In terms of the sub para (v) of para 2 of this OM, Night Duty Allowance is to be computed taking into account the rates of pay including Dearness Allowance and CCA, in force on the basis of the recommendations of the 4th Central Pay Commission. However, these rates have not been revised on the basis of the pay structure that came into force after the reports of 5th and 6th Central Pay Commissions. 2. Aggrieved by this non-revision of the rates of NDA, a number of applications have been filed by the Defence Civilian employees in various Courts/Tribunals. In OA No. 34/2008, filed by Shri Ram Kumar & Others. Hon. Central Administrative Tribunal, Jodhpur Bench passed orders dated 5 Nov 2009 in favour of the applicants. The appeals filed by the Union of India in the Hon’ble High Court of Rajasthan (DB Civil WP No. 9927/2010) and in the Supreme Court of India (SLP No. 8276/2012) against the above Oder dated 5 Nov. 2009 of Hon. C.A.T., Jodhpur Bench, were dismissed on 1 Aug 2011 and 8 May 2012 respectively. 3. 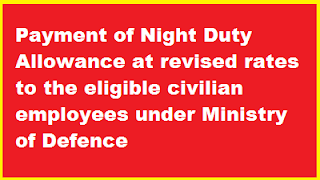 The issue of payment of NDA at revised rates to the eligible Defence Civilian Employees, has been examined in the MoD in consultation with Ministry of Finance (Deptt of Expenditure), Deptt of Personnel & Training and Ministry of Law and Justice. In the light of the observations made by MoF(DoE), DoP & T and M/o L&J, a conscious decision has been taken with the approval of Competent Authority in Ministry of Defence to make payment of the Night Duty Allowance to the eligible Defence Civilian employees (Industrial and non-industrial employees), based on the revised pay and allowances drawn by them w.e.f. 1st Jan 2006 and payment of arrears from April, 2007, in terms of Hon. C.A.T., Jodhpur Bench order dated 5 Nov. 2009, in OA No. 34/2008 filed by Shri Ram Kumar & Others, as upheld by the Hon’ble Supreme Court of India. 4. All other terms and conditions as laid down in the MoD ID No. 6(4)/88/D(Civ-I) dated 12 Oct. 1989 and dated 15 March 1990, as amended from time to time, shall remain unchanged. 5. The issues with the concurrence of Ministry of Defence (Fin.) vide their ID No. 89/AG/PB dated 8th May, 2015. Hoping to strike a chord with around 3 million ex-servicemen, Congress vice-president Rahul Gandhi will this week nudge the Modi government to deliver on its election promise to implement one-rank one-pension (OROP) in the armed forces. Gandhi will meet a group of ex-servicemen at the party headquarters on Saturday where he will try to corner the NDA government, a Congress leader said. Over the last few weeks, the three-time Amethi MP has been unsparing in his attacks on the Narendra Modi government over issues concerning farmers, landless labourers, netizens, middle class home buyers and fishermen. 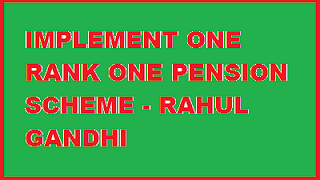 Gandhi had raised the demand with the UPA government and persuaded the finance ministry to approve OROP. This would give retired soldiers of the same rank and the same length of service the same pension, irrespective of when they retired. “I am on your side. I understand your concerns. You give your life for the country. I will do all that I can to see that your demands are met,” Gandhi had told a group of 1,000-odd ex-servicemen from Haryana, Himachal Pradesh, Uttarakhand, Rajasthan and Punjab during an interaction in February 2014. Congress leaders pointed out that the BJP had pledged to quickly roll-out OROP but appeared to be dithering on its implementation. However, government sources hinted that the long-pending demand could be announced anytime soon, with a corpus of about ` 8,400 crore. The push for OROP will also benefit about 6,00,000 widows and 1.5 million serving military personnel. Grant of Conveyance Allowance to blind and orthopaedically handicapped Government Employees. Subject: Grant of Conveyance Allowance to blind and orthopaedically handicapped Government Employees. The undersigned is directed to invite a reference to Office Memorandum No. Fin(C)B(7)-40/80-II dated 12th May, 1986 and to state that the matter to further enhance the rate of conveyance allowance to blind and orthopaedically handicapped. Government employees was under consideration of the Government for some time past. After careful consideration, the Governor, Himachal Pradesh is pleased to raise the rate of the conveyance allowance prescribed in the aforesaid O.M. of Finance Department from Rs.75/-p.m. to Rs.500/-p.m. in respect of those Government employees having disability of more than 70%. However, in the case of those Government employees where the percentage of disability is below 70%, the existing rate of conveyance allowance mentioned in aforesaid O.M. dated 12th May, 1986 shall continue to be allowed. 2. Other conditions regarding grant of this concession as prescribed vide O.M. No. Fin(C)B(7)-40/80 dated 3rd July, 1982 and O.M. of even No. dated 24th July, 1987 shall remain unchanged. 3. The conveyance allowance at the above rate shall be admissible with effect from the date of issue of this O.M. Dearness Allowance to Teaching Staff on UGC/AICTE/ICAR scales of pay and Judicial Officers/Pensioners on NJPC pay scales Revision of rates. Sub:-Dearness Allowance to Teaching Staff on UGC/AICTE/ICAR scales of pay and Judicial Officers/Pensioners on NJPC pay scales Revision of rates. (1) G.O. No. FD 10 SRP 2013 dated 20-05-2013. (2) G.O. No. FD 12 SRP 2013 (II) dated 12-06-2013. (3) G.O. No. FD 22 SRP 2013 dated 10-10-2013. (4) G.O. No. FD 07 SRP 2014 dated 11-04-2014. (5) G.O. No. FD 18 SRP 2014 dated 01-10-2014.
pay with effect from 1st January 2015. 2. For the purpose of this order, the term 'Basic Pay' means, the pay drawn by a Government employee in the UGC/AICTE/ICAR and NJPC scales of pay applicable to the post held by him. 3. Basic Pay shall not include any other emoluments. 4. Government are also pleased to sanction increase in the rates of Dearness Allowance to NJPC Pensioners/Family Pensioners from the existing 107 % to 113 % of the basic pension/family pension with effect from 1st January 2015. 5. The increase in Dearness Allowance admissible under this order is payable in cash until further orders. 6. The payment on account of Dearness Allowance involving fractions of 50 paise and above shall be rounded off to the next rupee and fractions less than 50 paise shall be ignored. 7. The Dearness Allowance will be shown as a distinct element of remuneration and will not be treated as pay for any purpose. Inclusion of Aadhaar (Unique Identification) number in Service Book of Government servants. The undersigned is directed to refer to Department of Personnel & Training’s O.M. 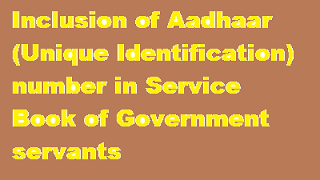 of even number dated 3rd November, 2014, on the subject mentioned above, where all Ministries/Departments were requested to ensure that the service books of all employees have an entry of the employees’ Aadhaar number. 2. All Ministries/Departments of the Government of India are requested to intimate action taken in this regard and also the number of employees whose service books have been seeded with their respective Aadhaar number. 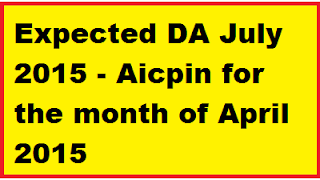 Subject: Incentive for mobilization and registration of subscribers under Atal Pension Yojana. I am directed to say that incentive structure for Banks to mobilize and register subscriber under Atal Pension Yojana has been under the consideration of PFRDA. As Banks are expected to engage the Banking Correspondents (BCs) / Micro Finance Institutions (MFIs) / Non-bank aggregators to mobilize the subscribers, they can Share the incentives with such BCs / MFIs / Non-bank aggregators etc. in the ratio 50:50 :: Banks : BCs/MFIs/ Non-bank aggregators. 3. Banks are advised to contact aggregators for shifting of existing eligible Swavalamban subscribers to APY as per the scheme. 4. Payment of incentives to banks each year will be made after the completion of the financial year on receipt of funds from the government. PM Narendra Modi is likely to make an announcement later this month on ex-servicemen’s long-pending demand of one-rank one-pension. 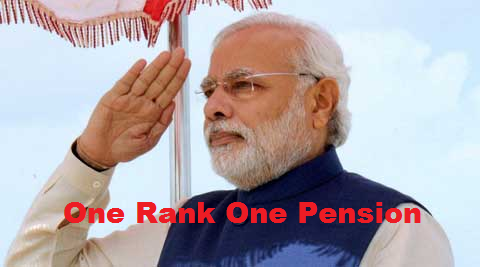 Prime Minister Narendra Modi is likely to make an announcement later this month on ex-servicemen’s long-pending demand of one-rank one-pension. Rao Inderjit Singh, Minister of State for Defence on Tuesday told media persons that since coming to power in May last year the National Democratic Alliance consulted all stakeholders on the issue and then arrived at a decision. “We came to power in May last year. Over the past one year we have consulted political parties, all stakeholders on one-rank one-pension, whether they are servicemen or ex-servicemen ,” he said. “After having consulted everybody, a decision has been taken and the announcement of the decision is most likely to be made by the prime minister this month,” Singh said on the sidelines of a ceremony held to launch the fourth and last anti-submarine warfare ship being made for the Indian Navy. The minister said the issue was discussed and debated over the past two years and during the 2014 general election campaign the parties now in power had promised to solve the issue after talking to all stakeholders. 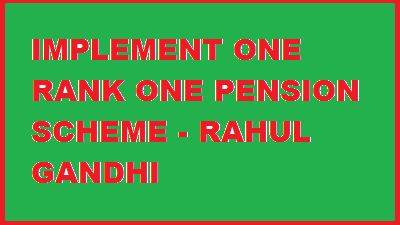 The “one rank, one pension” demand implies payment of a uniform pension to personnel retiring in the same rank with the same length of service, irrespective of their date of retirement. 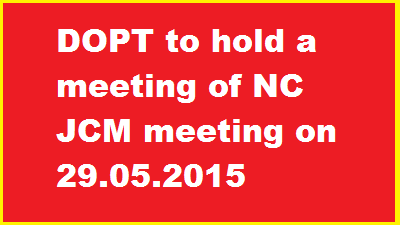 The full Settlement is under preparation and is expected to be signed on the 25th May, 2015 (Monday). Central Civil Services (LTC) Rules, 1988- Clarification regarding eligibility of Home Town Concession- Frequently Asked Questions. Whether the employees whose Headquarters/ Place of posting and Home Town are same, are eligible for Home Town LTC? No. Government employees whose headquarters/ place of posting and Home Town are one and the same are not eligible for Home Town LTC. Whether the employees who are not eligible for Home Town LTC may avail the Special Concession scheme of conversion of Home Town LTC to travel to North East Region, allowed by DoPT’s 31011/3/2014-Estt.A-IV 26.09.2014? Whether the employees residing in cities / towns outside Delhi which fall under other states of National Capital Region (NCR) are eligible for Home Town Concession?